Review date: 24 March 2004. WeWa are a popular brand in the solid state digital music player market. 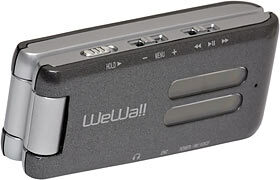 Most of WeWa's products, however, are like many other odd-brand MP3 players. They're probably powered by SigmaTel, they're probably made by Tai Guen Enterprise, and they may look mildly different, but they all work much the same. ...but this one bucks the trend. 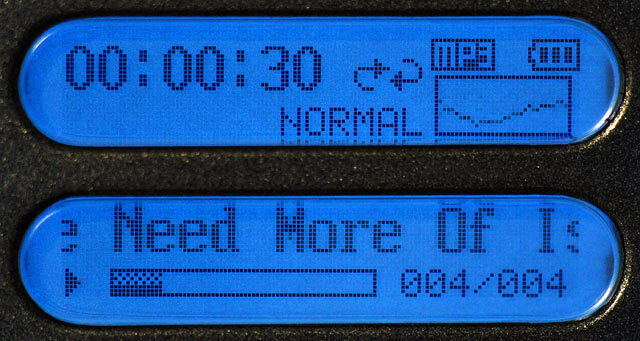 It's WeWa's WMP-3000+ "Butterfly", and its basic functionality is the same as the various George-alikes. MP3 and WMA playback, plug-and-go USB Mass Storage Device operation for file transfers (only USB 1.1 speed, I'm afraid), and "256Mb" of storage. As with pretty much every storage device that claims a particular capacity, this one doesn't give you quite as many real megabytes as it says on the sticker. But its formatted capacity is 247Mb, which isn't bad. The Butterfly comes in grey, red and blue versions (I got the boring grey for review), and cost $AU291.50 from Aus PC Market here in Australia, when this review was new in March 2004. The world of MP3 players moves fast, and the Butterfly isn't available from Aus PC any more; they have plenty of other MP3 players, though. I now return this review to its original present tense. That ain't dirt cheap - pay Apple $AU157.50 more and they'll send you a 15Gb iPod - but this is a 36 by 83 by 19.5mm device that weighs 64 grams (1.4 by 3.3 by 0.77 inches, 2.3 ounces), and it packs in a lot of extra stuff. 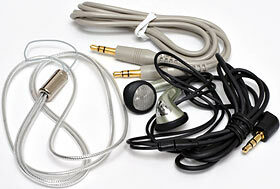 Like a lot of other current small players, this one can record voice notes, with an integrated microphone. That's where the basic features stop and the fancy ones take over, though. The most obvious fancy feature is that this player has speakers. They're tiny, they're tinny, and there really might as well be one bigger one instead of two little ones for all the stereo you can get with speaker separation of about 4.5 inches. But they work, and they're surprisingly loud. I measured about 70dbA at 50cm, with volume set to maximum and hideous bass distortion. The distortion's less of a problem for speech, though; this thing's loud enough that you'll be able to play voice notes back on it on the other side of a quiet room and hear them clearly. An extra you can't see is that the Butterfly has an internal rechargeable lithium ion battery. It charges whenever the Butterfly's plugged into a USB port. To hook up, you just fold the Butterfly's wings right back, exposing the USB plug - I think this thing's named after the knife that's named after a butterfly. The Butterfly's wide enough that it probably won't fit if there's a cable connected to the USB port next door, and it doesn't come with a USB extension cable, but you can get those cheaply enough. If you have to plug your Butterfly into the back of a computer, you'll want one. The Butterfly also has a stereo FM tuner, which isn't all that amazing these days - but this one can be set for European, Japanese or "other" channel intervals ("other" works here in Australia), and it of course has proper presets so you don't have to re-scan stations every time you select FM mode. Like almost every other little portable FM radio in the world, this one uses the headphone cable as its antenna, so you have to plug the 'phones in even if you only want to listen to the radio through the little speakers. 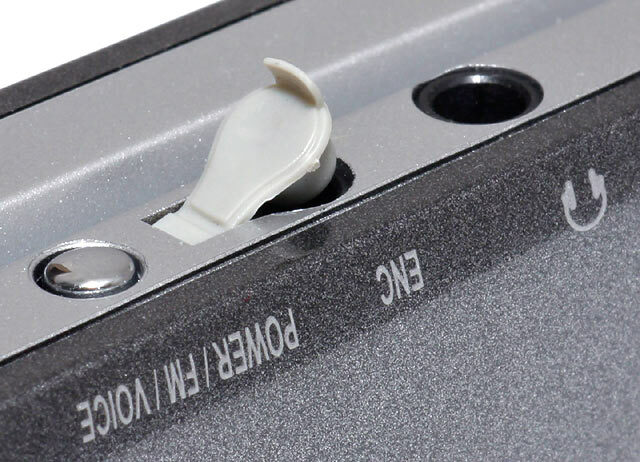 There's also a line in connector, under a snug little rubber cap that people without fingernails, pointy tools or needle nosed pliers will never be able to extract. Plug in a line level stereo source and the player automatically switches into line-record mode, encoding whatever you feed it into a 96 kilobit per second stereo constant bit rate MP3. You can start and stop recording at will, and record as many files as you like - well, up to the storage limits of the Butterfly and the number limits of the "line_xxx.mp3" file names, anyway. The sound quality of these recordings is good enough to be able to tell what music sounds like, but not good enough to enjoy it. It's not the lousiest 96 kilobit CBR encoding I've heard, but there are plenty of underwater effects. Still - proper line in recording, people! The Butterfly, by the way, also records voice in MP3 format, instead of the low bit rate uncompressed WAVs that older tiny-players have used. Voice clips are only 32 kilobit per second mono, so there's awesome amounts of recording space on the 247Mb Butterfly. As is usual for these little gadgets, by the way, the Butterfly's voice-note microphone is omnidirectional, and sensitive enough to produce a perfectly clear recording of normal speech when the recorder's held at arm's length with the microphone side facing away from you. It's also tolerant of overload; you can press it right up to your mouth and still get a quite intelligible, if distorted, result. The Butterfly's display is split into two, with a similar overall pixel count to the one-piece displays of other weeny-players. The designers of this thing, though, have given some thought to the user interface, and it works surprisingly well. Every screen makes good use of the real estate available - menus, for instance, have a horizontal row of icons with text under them. This may seem a bit obvious, but it's clearly not to the people who make little MP3 players whose menus are vertical lists that let you see only two or three items at a time, wasting lots of space to the right of the text on the skinny horizontal screen. The Butterfly's controls are about as ergonomic as you can expect from a tiny-player. 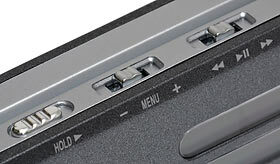 The power button on the other side of the player does double duty as a mode switcher (click it to cycle through MP3, FM and voice record modes, hold it to turn off), but the pair of levers on this side handle most of the control work. They're both "clickable" - you can push them in as well as move them back and forth. Between them, they make the Butterfly quite easy to handle - though large-fingered people who bite their nails may beg to differ. The play/pause/skip/scan lever works in the usual way. The menu lever, however, is the volume control if you just move it back and forth without clicking it. Click it and you get the setup menu, which is easy to navigate partly because of the abovementioned sensible layout, and partly because the designers have left out useless stuff. There's no option to change the voice recording bit rate, for instance. You do, however, get the option to change the all-important MP3 playback visualisation mode. You can pick an oscillator, horizontal two-bar level display or vertical multi-bar spectrum display, all of which get a mighty 13 by 32 pixels of the screen to do their thing on. When I first started playing with the Butterfly, it seemed, to my horror, to always have its speakers turned on, whether or not headphones were plugged in. Fortunately, it just doesn't know whether headphones are there or not - the speakers are turned on and off with a setup menu option. The rest of the setup menu is the usual stuff - select how long the blue backlight stays on after you do something, change screen contrast, set equalisation mode (including, blessedly, a no-EQ flat mode), choose repeat mode (single, random, all, folder), and so on. Unusually, there's a playlist option as well, with an internal playlist editor that works as well as an editor with a one-line display can be expected to. I dare say the editor has its uses, but if you've packed the player with 60 files I doubt you're going to be too keen to shuffle through all of them one at a time to pick the play order you want. Here's the other hardware you get with your Butterfly. One little plastic-coated lanyard, one pair of I Can't Believe They're Not Headphones (you don't have to spend much to get something a lot better), and one stereo 1/8th-to-1/8th lead. This last lets you easily hook the Butterfly's line-in jack to anything with a 1/8th inch socket - other portable audio devices and computers, mainly. Drop a few bucks on a couple of other adapters (RCA-to-1/8th and 1/4-to-1/8th) and you'll be able to hook up to most other line out connectors. The Butterfly's box (another of those nifty little TGE ones with a magnetic latch on the lid) also contains an exceedingly basic paper pamphlet-manual, and a software CD packed with a grand total of 8.9Mb of data. That's all it needs, though. There's a driver for Win98 users (the Butterfly should Just Work on later Windows versions, and possibly also recent Mac OS and Linux versions, though the Mass Storage Device standard isn't actually quite as standardised as it should be...), and a proper 17 page PDF format manual. This manual's unusually informative about the player's technical details (mentioning the 10-milliwatts-per-side headphone power output, for instance), and quite comprehensible. There's a perhaps-someone-at-WeWa-is-German warning not to clean the player with benzene, but that's about it for weirdness. The Butterfly's speaker output is unexpectedly loud, and it drives headphones well, too; at full volume it got quite respectable response out of my big Sennheiser HD 590s without any very noticeable signs of running out of breath. Its flat EQ setting seems to be pretty much flat, too. Some little players have nasty frequency response oddities even when they're not supposed to be doing anything to the sound, but this one doesn't. Did the Butterfly sound better, and louder, through an amp? Yes. Is it essential that you get an amp to use with this player? No. Battery life was good, too. The Butterfly's meant to run for "up to 15 hours" from a charge; I've run it long enough to know that this isn't a horrendous lie, but I don't know how close to 15 hours you're going to get without setting the headphone volume to essentially zero. Since you can only fit a bit more than four hours of 128 kilobit per second music into the Butterfly's memory, and since it recharges automatically whenever it's connected to a USB port, and since a full from-nothing charge only takes a couple of hours, I think most people should be very happy with the battery life. Bear in mind that rechargeable batteries don't last forever, and that lithium ion batteries in MP3 players commonly need replacing after a couple of years of normal use - or maybe less than a year, for really heavy users. This player can be dismantled, though, so anyone who can get hold of one of the weeny flat batteries it uses and knows one end of a soldering iron from the other should be able to swap in a new one. While testing the Butterfly, I noticed that the battery icon sometimes blinks to indicate little charge left, when there's actually plenty of juice remaining. I think running hefty headphones and/or the speakers at high volume can cause this. No problem, though; the player doesn't actually crap out. File transfer was about as fast as I expected. The Butterfly's only a USB 1.1 device; you can plug it into a USB 2 port and it'll work fine, but you won't get the impressive transfer rates that full speed USB 2 can deliver. When I copied 108Mb of MP3s to it (18 files worth), I got a write speed of about 525 kilobytes per second, which is unexciting but acceptable, even if you're moving more than 200Mb of data. Read speed was only a little better, at about 570k/s. If you want a carry-around storage device for a couple of hundred megabytes of files, the Butterfly will do, but a USB 2.0 flash drive (or a USB 2 card reader with a "256Mb" memory card) won't make you wait ten minutes for reads and writes. Most people don't shift that much data very often, though. If you're only dealing with a few megabytes of stuff at a time, or don't mind starting to load your MP3 player with new music ten minutes before you depart, then this speed is perfectly fine. The Butterfly's build quality is good enough, but the hinge between the two halves wiggles too much horizontally to really inspire faith. It'd be good if a pin dropped into a hole at the far end of the player when it was closed, to stop it flexing this way and that in your hand; it's got two clear rubber buffers that stop the two halves of the player from rubbing on each other, but that's all they do. 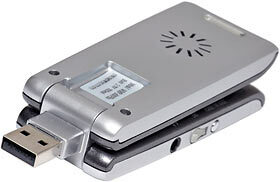 The flash-memory MP3 player market is filled with very similar products. It's nice to see something genuinely different. It's even nicer when that something works well. If you don't care about the speakers, FM tuner and line in, then you might as well buy a cheaper player than this - Aus PC Market have quite a few. The Butterfly's extra features aren't just tinsel, though; people need devices that do what this thing does. If you're looking for an MP3 player that can do useful things as well as fun stuff, the WeWa Butterfly may be just what you want. Recommended. Aus PC Market don't sell this product any more (though they have plenty of other MP3 players), but you can still try a price search at DealTime!